Turkish table lamp handmade by master craftsmen. Geometrical shaped lampshade, green colour glass in the shape of a star. Perfect for lighting hallways, bedrooms, living rooms, or lounges. Ideal for Arabic, Turkish or even rustic environments. Dimensions: Height: 15 cm. Width: 10 cm. Turkish table lamp crafted by artisans. Geometrical shaped lampshade, Star-shaped glass in yellow and red. Perfect for lighting in foyers, bedrooms, living rooms or banqueting rooms. Ideal for decoration with Arabic-Turkish or even rustic styles. Decorative lamp. Dimensions: Height: 15 cm. Width: 10 cm. Turkish table lamp handmade in the traditional way. Star-shaped mosaic lampshade, red coloured glass. Perfect for use in Arabic, Turkish or even rustic environments. Ideal for lighting foyers, lounges, living rooms or bedrooms. Decorative lamp. Dimensions: Height: 15 cm. Width: 10 cm. Turkish table lamp handmade in the traditional way. Lampshade with geometric star shapes, glass in turquoise colour. Perfect for lighting hallways, bedrooms, living rooms or lounges. Ideal for environments with Arabic-Turkish or even rustic styles. Decorative lamp. Dimensions: Height: 15 cm. Width: 10 cm. 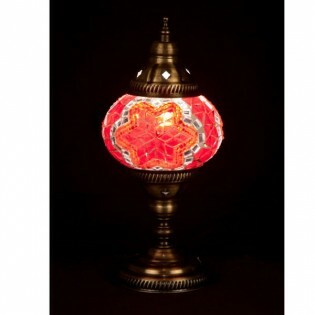 Turkish table lamp handmade in the traditional way. Star-shaped mosaic lampshade, glass in white colour. Perfect for lighting in bedrooms, living rooms, lounges, living rooms or foyers. Ideal for Arabic-Turkish or even rustic decoration. Decorative lamp. Dimensions: Height: 15 cm. Width: 10 cm. Turkish table lamp crafted by artisans. Geometrical shaped lampshade, green star-shaped glass. Perfect for lighting in foyers, bedrooms, living rooms or banqueting rooms. Ideal for Arabic, Turkish or even rustic style decoration. Decorative lamp. Dimensions: Height: 30 cm. Width: 15 cm. 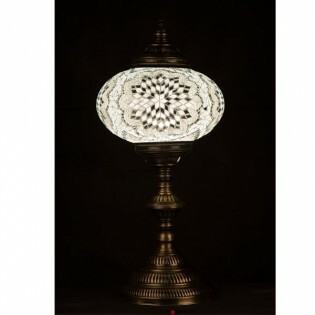 Turkish table lamp handmade in the traditional way. Star-shaped mosaic lampshade, red coloured glass. Perfect for lighting bedrooms, living rooms, lounges, reception areas or foyers. Ideal for Arabic, Turkish or even rustic style decoration. Decorative lighting. Dimensions: Height: 30 cm. Width: 15 cm. Turkish table lamp handmade. Geometrical shaped lampshade, turquoise coloured glass with star shape. 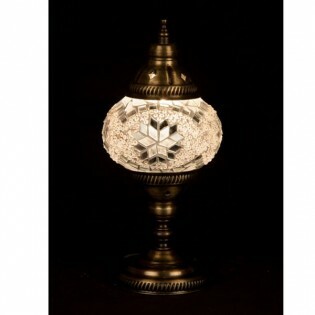 Perfect for lighting in foyers, bedrooms, living rooms or sitting rooms. Ideal for Arabic, Turkish or even rustic environments. Decorative lamp. Dimensions: Height: 30 cm. Width: 15 cm. 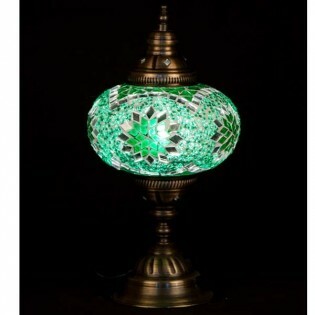 Turkish table lamp handmade in the traditional way. Lampshade with geometric star shapes, glass in white colour. Perfect for lighting hallways, bedrooms, living rooms or lounges. Ideal for Arabic, Turkish or even rustic environments. Decorative lamp. Dimensions: Height: 30 cm. Width: 15 cm. 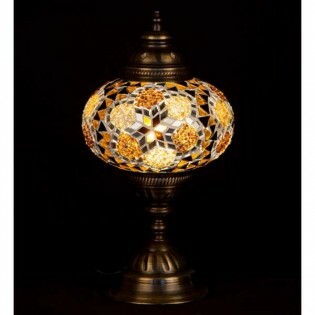 Turkish table lamp handmade in the traditional way. Star-shaped mosaic lampshade, yellow-and-black coloured glass. 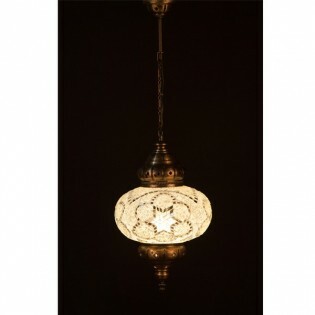 Perfect for lighting Arabic, Turkish or even rustic environments. Ideal for reception rooms, lounges, living rooms or bedrooms. Decorative lamp. Dimensions: Height: 30 cm. Width: 15 cm. Turkish table lamp handmade in the traditional way. 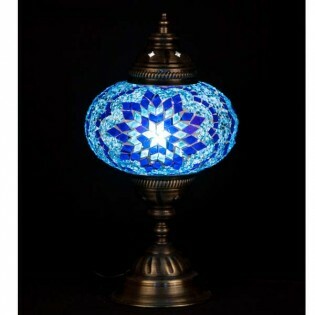 Star-shaped mosaic lampshade, glass in blue color. 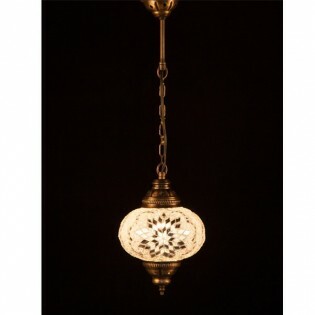 Perfect for lighting Arabic, Turkish or even rustic environments. Ideal for lighting foyers, lounges, living rooms or bedrooms. Decorative lighting. Dimensions: Height: 32 cm. Width: 16 cm. 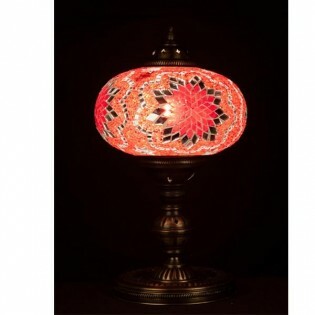 Turkish table lamp handmade in the traditional way. Star-shaped mosaic lampshade, green coloured glass. Perfect for lighting bedrooms, living rooms, lounges, reception areas or foyers. Ideal for Arabic style decoration, Turkish style or even rustic. Decorative lamp. Dimensions: Height: 32 cm. Width: 16 cm. Turkish table lamp crafted by artisans. Geometrical shaped lampshade, cristales en forma de estrella en color rosa. Perfect for lighting hallways, bedrooms, lounges or living rooms. Ideal for Arabic style decoration, Turkish style or even in rustic environment. Decorative lamp. Dimensions: Height: 32 cm. Width: 16 cm. Turkish table lamp handmade. Geometrical shaped lampshade, red coloured glass and the shape like a star. Perfect for lighting hallways, bedrooms, living rooms, or lounges. Ideal for Arabic, Turkish or even rustic environments.Decorative lamp. Dimensions: Height: 32 cm. Width: 16 cm. Turkish table lamp handmade in the traditional way. Lampshade with geometric star shapes, yellow-and-black coloured glass. 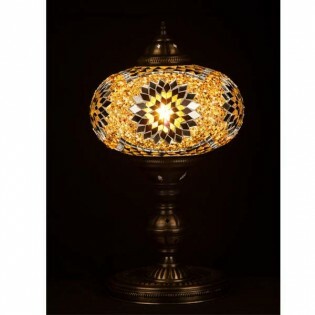 Perfect for lighting in hallways, bedrooms, lounges or living rooms.Ideal for Arabic, Turkish or even rustic environments. Decorative lamp. Dimensions: Height: 32 cm. Width: 16 cm. 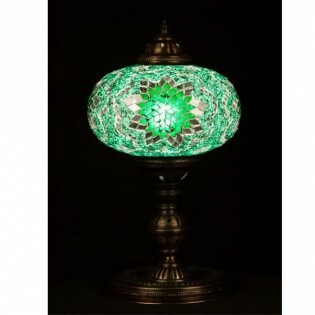 Turkish table lamp handmade in the traditional way. Lampshade with geometric star shapes, amber coloured glass. Perfect for lighting hallways, bedrooms, living rooms or lounges. Ideal for Arabic-Turkish or even rustic environments. Decorative lamp. Dimensions: Height: 43 cm. Width: 24 cm. Turkish table lamp handmade. Geometrical shaped lampshade, blue coloured glass in the shape of a star. Perfect for lighting hallways, bedrooms, living rooms, or lounges. Ideal for Arabic, Turkish or even rustic environments. Decorative lamp. Dimensions: Height: 43 cm. Width: 24 cm. Turkish table lamp handmade in the traditional way. Star-shaped mosaic lampshade, green coloured glass. Perfect for lighting in Arabic, Turkish or even rustic environments. Ideal to be placed in halls, lounges, living rooms or bedrooms. Decorative lamp. Dimensions: Height: 43 cm. Width: 24 cm. 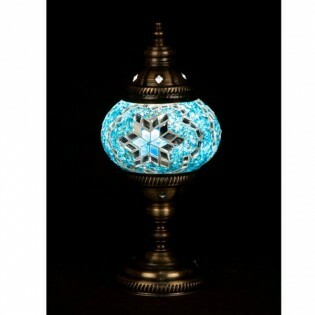 Turkish table lamp handmade in the traditional way. Star-shaped mosaic lampshade, red coloured glass. Perfect for lighting bedrooms, living rooms, lounges, reception areas or foyers. Ideal for Arabic, Turkish or even rustic style decoration. Decorative lamp. Dimensions: Height: 43 cm. Width: 24 cm. Turkish table lamp crafted by artisans. Geometrical shaped lampshade, star-shaped glass in black and yellow. Perfect for lighting in hallways, bedrooms, living rooms or lounges. Ideal for Arabic style decoration, Turkish style or even in rustic environment. Decorative lamp. Dimensions: Height: 43 cm. Width: 24 cm. Turkish table lamp crafted by artisans. Geometrical shaped lampshade, star-shaped glass in blue. Perfect for lighting in hallways, bedrooms, living rooms or lounges. Ideal for Arabic-Turkish style decoration or even in rustic environments. Decorative lamp. Dimensions: Height: 71 cm. Width: 34 cm. Turkish table lamp handmade in the traditional way. Lampshade with geometric star shapes, green coloured glass. Perfect for lighting hallways, bedrooms, living rooms or lounges. Ideal for Arabic, Turkish or even rustic environments. Decorative lamp. Dimensions: Height: 71 cm. Width: 34 cm. 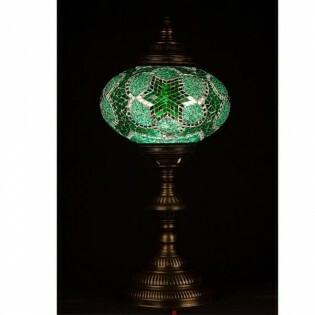 Turkish table lamp handmade in the traditional way. 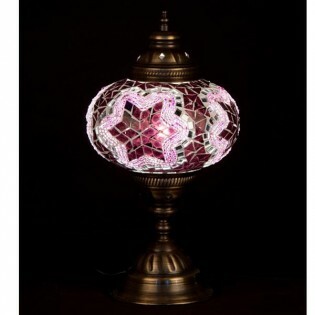 Star-shaped mosaic lampshade, glass in different colours. Perfect for use in Arabic, Turkish or even rustic environments. Ideal for lighting foyers, lounges, living rooms or bedrooms. Decorative lamp. Dimensions: Height: 71 cm. Width: 34 cm. Turkish table lamp handmade. Geometrical shaped lampshade, white coloured glass with a star shape. Perfect for lighting hallways, bedrooms, living rooms, or lounges. Ideal for Arabic, Turkish or even rustic environments. Decorative lamp. Dimensions: Height: 71 cm. Width: 34 cm. Turkish table lamp handmade in the traditional way. 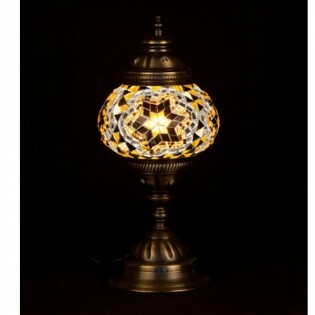 Star-shaped mosaic lampshade, yellow-and-black coloured glass. Perfect for lighting in bedrooms, lounges, living rooms or hallways. Ideal for Arabic-Turkish style decoration or even in rustic environments. Decorative lamp. Dimensions: Height: 71 cm. Width: 34 cm. 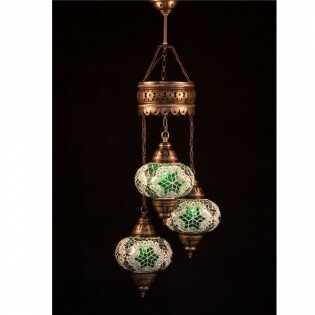 Turkish ceiling light with three globes and large link chains, manufactured by artisans. Star-shaped mosaic lampshades, with green, blue, white and red glass. Perfect for being placed in Arabic-Turkish style environments or even in rustic environments. Ideal for living rooms, bedrooms or entrances. Decorative lamp. Dimensions: Height: 85 cm. Width: 32 cm. Turkish Ceiling Light clamped with a large link chain, handmade in the traditional way. Globe with geometric star shapes, green coloured glass. Perfect for lighting bedrooms, living rooms, halls or lounges. Ideal for Arabic, Turkish or even rustic environments. Decorative lamp. Dimensions: Height: 55 cm. Width: 25 cm. Turkish Pendant Light clamped with a large link chain, crafted by artisans. Geometrical shaped lampshade, star-shaped glass in different colours. Perfect for lighting in lobbies, bedrooms, lounges or living rooms. Ideal for Arabic-Turkish style decoration or even in rustic environments. Decorative lamp. Dimensions: Height: 55 cm. Width: 25 cm. Turkish Pendent ceiling light with large link chain, handmade in the traditional way. Lampshade with star-shaped geometric shapes, pink coloured glass. Suitable for placement in lounges, halls, bedrooms or living rooms. Ideal for Arabic, Turkish or even rustic environments. Decorative lamp. Dimensions: Height: 55 cm. Width: 25 cm. Turkish Ceiling Lamp with large link chain, handmade in the traditional way. Mosaic globe in the shape of a star, red coloured glass. Perfect for lighting in living rooms, bedrooms, living rooms or lobbies. Ideal for Arabic style decoration, Turkish style or even in rustic environment. Decorative lamp. Dimensions: Height: 55 cm. Width: 25 cm. Turkish Ceiling Light con cadena de eslabones grandes handmade in the traditional way. Globe with star-shaped mosaic, white coloured glass. Perfect for being placed in Arabic-Turkish style environments or even in rustic environments. Ideal to be placed in halls, lounges, living rooms or bedrooms. Decorative lamp. Dimensions: Height: 55 cm. Width: 25 cm. Turkish Ceiling Lamp with large link chain, handmade in the traditional way. Globe with star-shaped mosaic, blue coloured glass. Perfect for lighting in living rooms, bedrooms, living rooms or lobbies. Ideal for Arabic style decoration, Turkish style or even in rustic environment. Decorative lamp. Dimensions: Height: 70 cm. Width: 25 cm. Turkish Pendent ceiling light with large link chain, handmade in the traditional way. Lampshade with geometric star shapes, glass in different colours. Suitable for placement in lounges, halls, bedrooms or living rooms. Ideal for Arabic, Turkish or even rustic environments. Decorative lamp. Dimensions: Height: 70 cm. Width: 25 cm. Turkish Ceiling Light with a large linked chain, handmade in the traditional way. Globe with geometric star shapes, red and yellow coloured glass. Perfect for lighting bedrooms, living rooms, halls or lounges. Ideal for Arabic, Turkish or even rustic environments. Decorative lamp. Dimensions: Height: 70 cm. Width: 25 cm. Turkish Pendant Light clamped with a large link chain, crafted by artisans. Geometrical shaped lampshade, star-shaped glass in white colour. Perfect for lighting in lobbies, bedrooms, lounges or living rooms. Ideal for Arabic-Turkish style decoration or even in rustic environments. Decorative lamp. Dimensions: Height: 70 cm. Width: 25 cm. 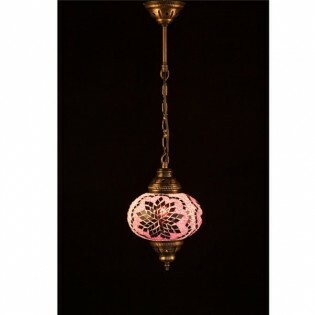 Turkish Ceiling Light with large link chain, handmade in the traditional way. Star-shaped mosaic globe with yellow and black glass. Perfect for being placed in Arabic-Turkish style environments or even in rustic environments. Ideal to be placed in halls, lounges, living rooms or bedrooms. Decorative lamp. Dimensions: Height: 70 cm. Width: 25 cm.